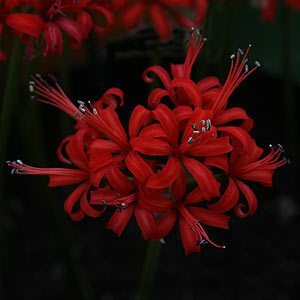 One of the truely outstanding nerine varieties is the red flowering Nerine fothergillii major. Brilliant large scarlet-orange flowers appear in late summer to autumn from this hardy clump forming bulb. Best in a sunny position where the tall flower stems can be allowed to rise above other plants. Individual stems can reach 50 – 60 cm in height. Plant in the border in a clump where the bulbs can be left undisturbed for a number of years. Or try growing in a container which can be moved to a prominent position when the bulbs are in full flower. Choose a sunny position and a well drained soil, plant with the neck of the bulb just above the ground level. Leave bulbs undisturbed for 4 – 5 years. They will need dividing after this. Nerine fothergillii major – Summary Information. Height – Flower stems to 50 cm in height. Spread – Will form a clump to 60 cm over time. Best divided before it reaches this stage. Flower Colour- Orange to red, very large flowers. Foliage – Green and strap like. Flowering period – Summer to early autumn. Container growing – Yes they grow well in containers. Nerine fothergillii major is easily propagated by division in spring to early summer when bulbs are dormant. Bulbs are readily available for sale with good quality bulbs at around $4 – 6 each.